FAITHblasts is a vision of LAS Media Group which is a division of LAS Productions, LLC, and a part of the The LAS Group. FAITHblasts was created out of the need of various individual's desires to be kept informed of the Faith based events that occur within our various communities Our goal is to connect the sponsors of a variety of events with those that are looking for activities to attend as well as to expand their networking areas. For each E-Blast that is sent out it is our Faith that God’s Favor is on the event, ministry or business; that is why it is called a FAITHblasts. It is with FAITHblasts that many organizations, church groups, and individuals alike have the opportunity to inform thousands of individuals of their events and services. Our goal is simple...we connect the event sponsors and services with those that are looking for activities, services and/or information as well as expanding their area of networking. The community is seeking to be informed; and it is the goal of FAITHblasts to assist in "Keeping The Community Connected". FAITHblasts makes connecting the regional community easy. Just provide the information and we do the rest! Our company will create a vibrant, eye catching presentation that has proven to increase the success of events of our current clientele. It is a simple and great way for you to reach an audience outside of your range but inside your region. We can show you how to effectually bring more awareness to your ministry, organization or business. Keeping the seats filled and branding the vision and mission of your purpose. We are ready to promote your next events and services? We would love to put your event on the featured events. 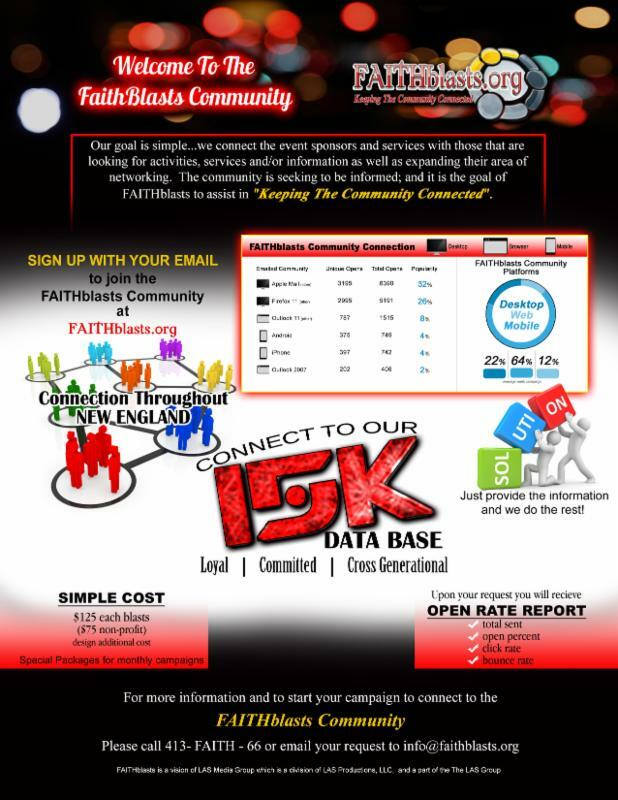 At present, the FAITHblasts Community email list is concentrated in Connecticut, Massachusetts, and Rhode Island and directly connects with a little under 15,000 Community members through emails… and we are still growing daily! Ready to promote your event or service? Go to our Service Tab to see the details of getting started.